In my podiatric practice, I have found that health insurance can impede patient care, by adding layers of complication and burden to all involved, particularly the patient and the provider. Private-sector insurance companies have profits to make, buildings to build, shareholders to satisfy, and overhead costs to pay. Government-run plans have costs, exclusionary policies, bureaucratic oversight, and a changing landscape as administrations change. Too much? Or not enough? New biofeedback tools help patients with lower-limb fracture in their struggle to understand how much weight to bear on an injured limb. Clinicians whose patients have a lower-limb fracture are faced with a paradox: whether or not to instruct them to place weight on the healing fracture. The lower limb and knee account for >75% of musculoskeletal injuries in today’s military. Osteoarthritis is among the leading causes of disability in the United States, costing billions of dollars each year in lost work hours, treatments, and doctor visits, and leaving people sidelined from day-to-day activities. That problem is mirrored and amplified in the military, a unique segment of the population that relies heavily on physical fitness and ability. Assessing how foot problems— namely, pain, neuropathy, and deformity— contribute to frailty syndrome has been a challenge for researchers, as transporting frail elders to lab facilities creates its own set of issues. But a recent study from the University of Arizona used wearable sensors to assess the seniors in their “natural” environment and found significant relationships between the number of foot problems and degree of frailty. In a pre-specified, 3-year extension of a randomized clinical trial of equivalence, close-contact casting maintained equivalence in function compared to surgery in older adults with unstable ankle fracture. Furthermore, no significant differences were reported in quality of life or pain. The authors concluded that the focus of treatment for these patients should be on obtaining and maintaining reduction until union, using the most conservative means possible. Both type 1 and type 2 diabetes are known for their life-threatening complications—in particular, blindness from retinopathy, kidney failure, and peripheral neuropathy. For patients with diabetes and foot pathology, amputation is a significant worry. A recent study in Foot & Ankle Specialist sought to understand just how much this population fears lower-extremity amputation (LEA). Flip flops, bare feet, or sports shoes: Which are best and which are worst? Many have long suspected the answer, but a new study would appear to resolve the question: Are flip flops really that bad for your feet? According to Chen and colleagues from the Department of Biomedical Engineering at The Hong Kong Polytechnic University, flip flops are most likely no better than barefoot when it comes to lower-limb co-contraction and joint contact force in the ankle. 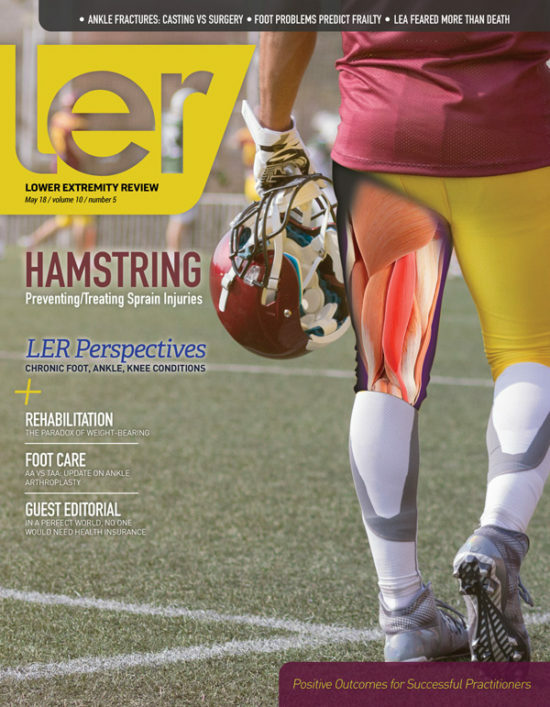 Editor’s note – Welcome to this first installment of a series for the readers of Lower Extremity Review: LER Perspectives. This planned, occasional series is designed to provide multidisciplinary voices to both common and uncommon conditions seen in clinical practice by podiatrists, orthotists and prosthetists, physical therapists, and other clinicians who care for patients with a lower extremity concern. The goal of the series is to provide a forum for clinicians from an array of specialties to offer perspective on a clinical question or issue. In this LER Perspective, we asked clinicians in daily practice to identify their most commonly seen foot and ankle and knee conditions that cause previously healthy and active adults to curtail activity. Dr Jay Segel offers the podiatric perspective, Mr Ken Johnson provides the physical therapy perspective, and Dr Kim Ross provides the chiropractic perspective. Please write to LER with your suggestions for topics that should be covered in a future installment. Dr. Segel is in private podiatry practice in Martha’s Vineyard, Massachusetts, and Director of Applied Podiatric Biomechanics at Noraxon USA. He is also a podiatric advisor and member of the medical education staff at Orthotic Holdings Inc.
Mr. Johnson is director of outpatient rehabilitation therapy services at Johns Hopkins Rehabilitation Network in Baltimore, Maryland. He has disclosed no relevant relationships. Dr. Ross is Director of Education Year 1, and associate professor at Canadian Memorial Chiropractic College, in Toronto, Ontario, Canada. He conducts educational sessions on behalf of Orthotic Holdings Inc.
New from Elite Orthopaedics is the Fracture Sock, designed to reduce skin irritation while wearing an ankle walker. The latex-free fracture sock is composed of 100% synthetic knit for superior moisture absorption. An improved cross stitch provides better compression, which helps reduce the risk of friction and lessens the risk of sock bunching. The product’s overall knit quality creates a comfortable barrier for the patient’s skin. Heel pain affects over 25% of the adult population and 20% of the pediatric population. Heel Defender is a patented heel orthotic device for off-loading the painful heel in both adults and children. Heel Defender is designed to remove the impact force from the heel, allowing for comfortable walking and standing while heel pain is being treated. The Pro Select Full Shell Air Walker from Elite Orthopaedics, Inc. features a full circumference shell design that provides controlled immobilization of the lower leg, ankle, and foot. A breathable insole, featuring patent-pending technology, allows for air to circulate to prevent the accumulation of heat during patient usage. Small perforations work to prevent humidity and help heat escape. Every human limb is different and changes over time, whether due to volume fluctuation, or painful skin breakdown. LIM Innovations now offers a customizable solution to combat volume fluctuation by providing a dynamic socket interface that can be adjusted by patients. The revised second edition of Pain Neuroscience Education: Teaching People About Pain is now available exclusively from OPTP. Written by physical therapists Adriaan Louw, Emilio Puentedura, Steve Schmidt, and Kory Zimney, this clinical guide contains significant updates and new content, explaining how to teach patients about pain. Sigvaris offers a new fun and colorful addition to its popular line of Microfiber Shades line of compression stockings – the Argyle. All Microfiber Shades compression socks, including the Argyle, are designed to incorporate advanced microfiber technology to provide ultimate comfort while also providing excellent breathability and moisture management. The compression stockings incorporate double-covered inlay yarns. Levitation from Spring Loaded Technology is the world’s first compact bionic knee brace. According to the company, Levitation is the only brace that can significantly reduce pressure throughout the knee while enhancing strength to alleviate pain and improve mobility for people with damaged knees.